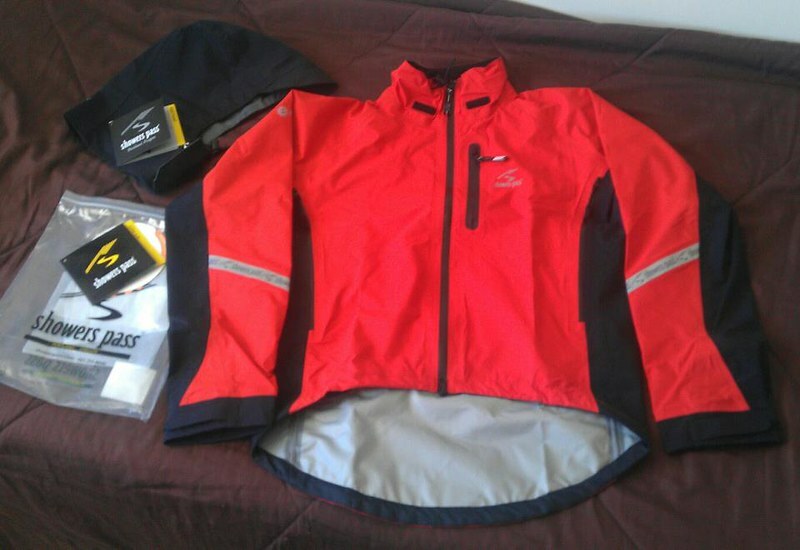 Well I did have a user review of the Showers Pass Elite 2.0 jacket planned, but All Seasons Cyclist has beat me to it! I bought the ‘chilli red‘ version of the Elite 2.0 last year and have been highly impressed with the design and effectiveness of this jacket. It seems expensive compared to other options but this is the sort of jacket that will last you many years and make cycling in wet weather much more comfortable. I also bought the (optional) hood which I was not as happy with as it seems too large and obstructs my vision when worn. I am have a slim build and am of average height (~180cm). I went for the medium size jacket which fits fine if you have one or two layers underneath to fill it out, otherwise it is a little loose around the chest for us slimmer folk. Another note regarding the design of this jacket is that it is aimed squarely at being a jacket for use while cycling, this is evident by the high cut front and low cut tail. Although it is possible to wear this off the bike as a jacket if needed, e.g. while on an extended tour, you will notice that it will stand out as a cycling jacket due to the general cut, design and lack of front pockets. This jacket works best in cooler to mild conditions, thanks to the breathable fabric and vent zip options. I wore it the other day in humid, windy, spitting conditions where the temp was around 18-20°C. After about 15 minutes of riding I had to fully open up the armpit vents and the front zip a little but I was able to keep the jacket on without getting too sweaty. In cooler (15°C and under) and less humid conditions this jacket would be even more effective. The chilli red colour is very visible and looks the best out in my opinion (the new blue option is also nice). Add this to the liberal application of 3M reflective tape and this jacket will have you clearly seen by other road users any time of the day or night. This jacket is a little bulky compared to rain skin jackets aimed at ultralight road cyclists, however this is due to the 3 layer eVent fabric and multiple vent zips. I bought my Elite 2.0 jacket from BicyclingHub.com for around $240 AUD shipped (Google search for latest discount/free shipping voucher codes which will bring the price down a bit form what is listed). Shipping will usually set you back an additional ~$18 AUD to Australia if you can’t find a voucher. The Showers Pass Elite 2.0 jacket also comes in both male and female versions to ensure a comfortable fit. Highly recommend! Solid 4.5 out of 5 stars from me! There is also a very comprehensive owner review on the Elite 2.0 jacket by Aushiker located here (which he managed to lose and had to buy a replacement). Check it out! I got caught in pretty heavy downpour a few nights ago on my commute home. Thankfully I had checked the weather forecast in the morning and was expecting some rain, so I brought my Showers Pass jacket. The jacket performed admirably in the rain. I did get pretty warm as I was riding at a reasonable pace to get home and out of the weather quickly – however the pit vent zips were very effective at letting the excess warmth out without letting much rain in. The biggest issue was that all the water was running off the jacket and down into my crotch area, so the front of my tights were soaked by the time I got home. Looks like it’s time to look around for a pair of rain proof cycling pants as I can imagine this wouldn’t be fun if you are out on tour and still need to ride 60km to get to your next destination. The offerings from Showers Pass (Club Convertible 2) and Ground Effect (Helter Skelters) are both on my short-list. Let me know if you have any experience with these or can recommend something else.